I don't think I'm alone when I say, I'm in the middle of a long-layer love affair. I can see how this style may appear sloppy to some, but for me, it feels so effortless and easy...and most importantly, so right for me. I went thrifting in the city this past weekend. The consignment stores I went in were huge and have the potential to become overwhelming quickly. I went in knowing what I was looking for, so it wasn't that bad. I was looking for long pieces, lace and fringe. I have to say, I did pretty well. But that is the key to not feeling overwhelmed while thrifting: go in knowing what you want. This entry was posted on Tuesday, May 27, 2014 and is filed under asos,grey,kimono,sam edelman,white. You can follow any responses to this entry through the RSS 2.0. You can leave a response. I'm loving long layers too, especially layered like you've done here. You look fabulous here! I did a drapey, layered look for my blog today, too, dear Sheree!! The raw, handkerchief hem of this white tunic adds so much interest and movement to your outfit...I know we'll be seeing it again (reimagined, of course!) over the coming weeks!! 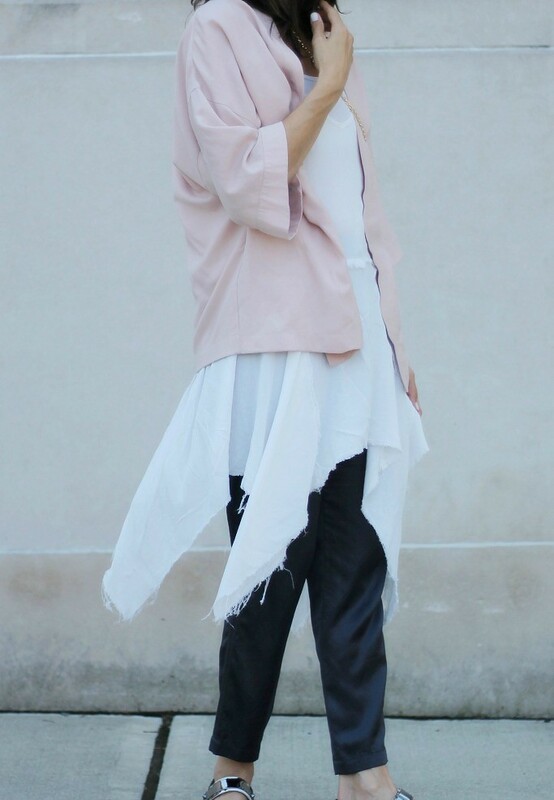 Love the layering! And the sandals are fab! now THAT is a great find, that piece is literally going to get you through every season!!! "lurve" it :))) ps can't wait to see the other finds! Love your sandals first of all... and the long top looks super cool too. Love it! This would look so pretty underneath a sweater too! Love the cream and pale pink combo. Visiting from the Trend Spin linkup! I added a small piece of lace fabric in the center to cover my bustier which meant I did not need to pay to have the dress altered at all. I was very pleased with my new dress! I absolutely love this look! So stylish and comfy.